Debbie Kirchhoff, executive director of strategic initiatives, is responsible for community engagement and outreach in the Greater Kansas City region; and identifying and implementing opportunities for new initiatives that align with the strengths of Kansas State University. These efforts also position K-State Olathe as a springboard for growth opportunities for Kansas State University. Kirchhoff brings more than 25 years of corporate relations, community engagement and leadership experience in the Greater Kansas City region. 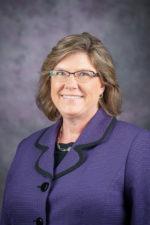 She joined the Kansas State University Foundation as the director of corporate and foundation relations for K-State Olathe from 2011-2014 and senior director of development for the university’s College of Veterinary Medicine from 2014-2016. Prior to coming to K-State, she served as major gift director for the University of Missouri-Kansas City’s College of Arts and Sciences. She has held development director and executive director positions at not-for-profit organizations in the Greater Kansas City area, including the Kansas Children’s Service League, Sunshine Center School and Safehome. Kirchhoff holds the Certified Fundraising Executive designation from CFRE International and is a certified workshop leader for Strategic Doing. She earned her undergraduate degree in business from Kansas State University and her Master of Business Administration from Mid-America Nazarene University. She has volunteered in the community for numerous organizations and currently serves on the board of directors for Youthrive. She has lived in Johnson County, Kansas, most of her life. Kirchhoff currently lives in Olathe, Kan., with her husband and has two grown children.